At Il Luogo di Aimo e Nadia in Milan, the chef Aimo Moroni found two great squires of the cultured and creative cuisine: Alessandro Negrini and Fabio Pisani. Among the restaurants in Milan, Il Luogo di Aimo e Nadia (www.aimoenadia.com) is considered the temple of educated cuisine, because love for ingredients brought Aimo Moroni to write a sort of culinary Divine Comedy of our beautiful country. 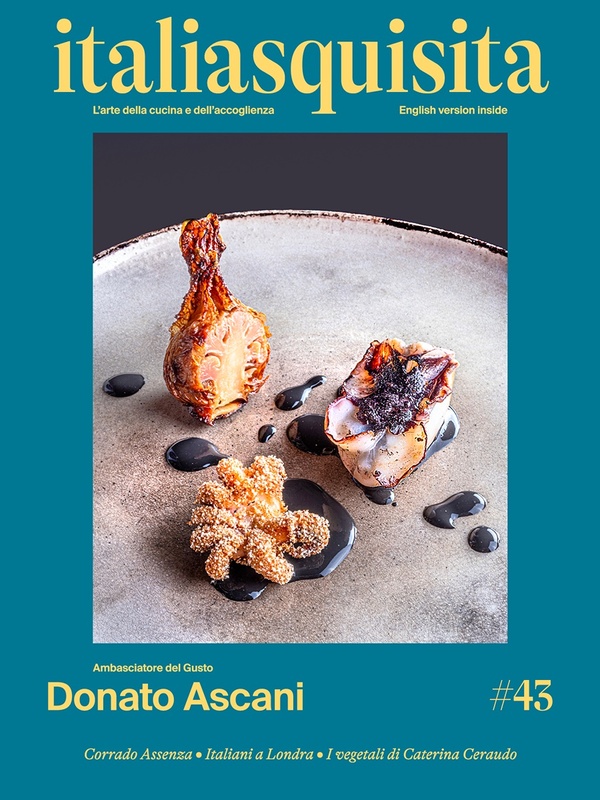 Now came the turn of his two young and talented sous chefs Alessandro Negrini and Fabio Pisani, who understood the original intent of Aimo Moroni and they rejuvenated it, giving that impetus to the restaurant that all the chefs hope to have in their kitchens. But who are Negrini Alessandro and Fabio Pisani? Alessandro Negrini comes from Valtellina (from Caspoggio, 1,200 meters per 1000 inhabitants) and is an explosive guy, "I became interested in this work due to the stories of a neighbor who traveled the world as a chef on ships, then my brother Giandomenico, although he was seriously ill, he gave me motivation after motivation, infusing perpetual energy in my heart. I leave then for Switzerland to learn foreign languages and the art of cooking, and at the Hotel Palace in St. Moritz, the patron Andrea Galli tells me about Aimo and Nadia Moroni”. After a few years take belongings and arrive there at eighteen. That day it poured, "May I come in?" asked him, but there was none. Entered in the kitchen and saw a lady dressed as a cook, who was making the Etruscan soup; without asking who was offered him to taste. "That lady so kind was Nadia Moroni in flesh and blood! That gesture made me realize that you can have all the technology possible, but are especially important the human relations”. Three years there, then, thanks to chef Pietro Leeman of "Joia” in Milan, he went back to Switzerland in Geneva at the Relais" Domaine de Châteauvieux" of Philippe Chevrier, a pupil of the legendary Fredy Girardet. "It opened in front of my eyes a new world, from the military hierarchy, I became a machine; I always thought at my brother Giandomenico struggling every day and I was supposed to do the same." Two years there and returned to Italy at the Santini family in the restaurant "Dal Pescatore" of Canneto Sull'Oglio for a year and a half. Nadia and family taught him the power of Italian cuisine, the essence of flavor contained in the simplicity of more than three ingredients. From there he went to work again at Aimo and Nadia Moroni: "Go to eat at someone else does not mean eating binge and then criticize, but to come out and feel the sensation that remains in the heart and in the brain. You have to be at least two years with a great chef to understand the philosophy and to not simply copy the recipes. Summarize my experiences until now? Geneva: rigor, organization, professionalism, work ethic. Santini: harmony, lightness and finesse. Aimo: major raw materials, taste, elegance, Italian. At Aimo it was a shock. As a man is an intelligent and caring person, is the only one that combines self-centeredness to humanity in a unique way. Unlike other chefs, Aimo is humble at nth level. He has done humanity a listener of his warhorses. Talk about Aimo and the same goes for Nadia, of course. They taught me that eating well is not the prerogative of the rich, the haute cuisine has high costs but to make a wonderful cuisine with mackerel is easy! " The other sous chef of Il Luogo di Aimo e Nadia is Fabio Pisani: "I started in the hotel school in Molfetta. The passion came through my uncle in France, which leads me to Avignon for two years at the Relais “Château de Montcaud”. But I wanted a three-star Michelin! However, I had to do a lot of mess. In France I found the work ethic and I learned the basic rules. I felt obsessively that I had to acquire the basics. In Paris at Guy Martin, at the restaurant "Le Grand Vefour" (3 Michelin stars), I was two and a half years, at the age of twenty years: the chef saw and appreciated me, and in three months I had the post of work as head of the fish. It was a very creative cuisine, based on spices, Mediterranean with French roots. There I met many people and now I have many friends around Europe. It is also why I strongly believe in the relationship of friendship”. But his determination led him then by Michel Roux at “The Waterside Inn” in England. "I do not choose the place according to the country, but according to what the kitchen could teach me. From Apulian Italian, it stimulated me being able to go to learn the basics, sauces, cooking to coat. Always interested me the basics of cooking. A pyramid without base no stands! By Michel Roux I was about three years. In a restaurant you have to be at least two years: during the first you begin to understand its philosophy, and the next year onwards you start to create something constructive”. Then one day the chef asked: "But you what cuisine would you like to do when grown?" He said: “I want to do a kitchen of my country". In that moment Fabio Pisani felt he wants to return to Italy. Even he ends up in the wise hands of Nadia Santini: "I heard the heart and soul of a family. Coming from the other realities of France, with other rules, there I realized that passion is a key ingredient”. Fabio Pisani is a determined person: for him to want is to can. "At the "Dal Pescatore "I was only a year and two months, because I knew that Aimo needed two people to carry out a precise gastronomic project. I went to eat in his "place" with Alessandro and, looking into his eyes, we knew immediately that it will be the opportunity of life. Aimo fascinated me when he spoke to describe his products. This is the restaurant that I always dreamed of: quality and class in a completely Italian context”. Attached to his land of Puglia, with a skillful farmer grandfather (olives, almonds, tomatoes), Fabio is very much in line with Aimo and its fundamentalist ideas of perfect raw material. His contribution is the rediscovery of exceptional products (wheat and burned chickling), the continuous research movement (chickpea flour) and local products. Do not miss the three video interviews with Aimo and his sous-chefs.